Product #55642 | SKU AMUCAL-100CMK-CBK | 0.0 (no ratings yet) Thanks for your rating! A standard Micro USB plug on one side and reversible USB connector on the other means connecting mobile devices is faster and simpler! 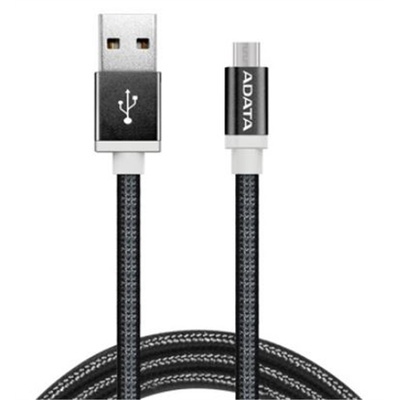 Reversible ease on Micro USB cables the ADATA USB Type A/Micro USB Braided Connection Cable (Black, 1 m) is perfect for Android and Windows devices! A standard Micro USB plug on one side and a reversible USB connector on the other mean connecting mobile devices to notebooks, desktops, and chargers is faster and simpler without stopping to figure out which side is up! Premium aluminum casings reduce EMI and multi-layered braided sleeves provide greater protection. Tough 2.4A-rated copper wires ensure fast charging and data transfer. Choose from 7 stylish colors and enjoy smarter USB!